What if you could evaluate yourself on your own mobile phone? What if your spare time could be used to learn new business skills? The EvaQuest application suite is a "Quest to knowledge" on several business topics : methodology, techniques, skills, ... Collect as many badges as possible and share them with you friends and colleagues. 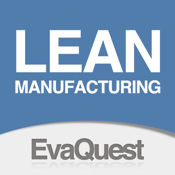 "Lean EvaQuest" is about the Lean thinking, credited to the success of Toyota. It's a continuous improvement approach mainly used in industries. Are you ready to take the challenge? Start your EvaQuest!